Note: this is a four university Network involving Sheffield Hallam University. This network brings together a number of people from disparate yet related academic backgrounds in science education, sociological studies, stem cell biology and mathematics education. 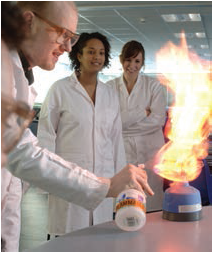 It also draws on the experience of the National Science Learning Centre based in York and the national network of Regional Science Learning Centres which offer the additional capacity to make a real difference in invigorating science education nationally. This network also includes a studentship based at Sheffield Hallam University.